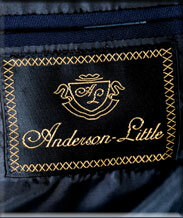 Anderson-Little was founded in 1933 by Morris B. Anderson, and began as a manufacturer of fine men’s clothing in Fall River, Massachusetts, and pioneered the concept of “factory direct to you” following World War II, when it opened its factory showroom directly to the public, for retail sales. Driven by the strength of this concept, by 1960 Anderson-Little had 11 retail outlets selling “factory direct to you” in Fall River, New Bedford, Providence, Hartford, Worcester, Springfield, New Haven, Bridgeport and other major markets in New England. Stuart Anderson, Morris’ grandson, joined the management team after his graduation from the Wharton School of Finance. By 1966, this family business had grown to 40 outlets and had become one of the most recognizable brand names in New England, and the company was sold to Richman Brothers, a national chain headquartered in Cleveland, Ohio. In 1968 Richman Brothers and Anderson-Little were sold to F.W. Woolworth Co., which operated and grew the Anderson-Little division to 100 stores. In 1992 Woolworth closed all the Richman Brothers stores, and all but 7 Anderson-Little stores. These 7 remaining stores were sold to Cliftex Manufacturing Co., a major supplier to Anderson-Little for many years. Cliftex closed all the remaining Anderson-Little stores in 1998. In early 2008 Scott Anderson and Stuart Anderson reclaimed the trademark rights to their family name. This is the re-launch of Anderson-Little.